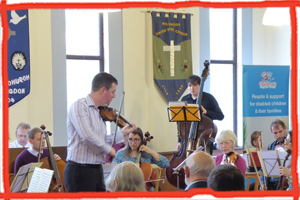 Sussex Strings, a group formed of local musicians who want to play some of the vast repertoire of string music, put on a charity concert at Trinity Church in Willingdon recently to raise funds for the Children’s Respite Trust. The concert included music by Boyce, Tchaikovsky and Barber, but the highlight was the lively performance of Vivaldi’s ‘Spring’ Violin concerto performed by Simon Smith. Many of the musicians and friends of the group baked cakes. In doing so helped towards the grand total raised of over £400. The grand total raised was one of the highest totals that Sussex Strings has ever raised. They hold two charity concerts a year and this is the third time they have chosen Children’s Respite Trust. Certainly, the total raised will make a big difference for the Trust’s work for disabled children across the county.